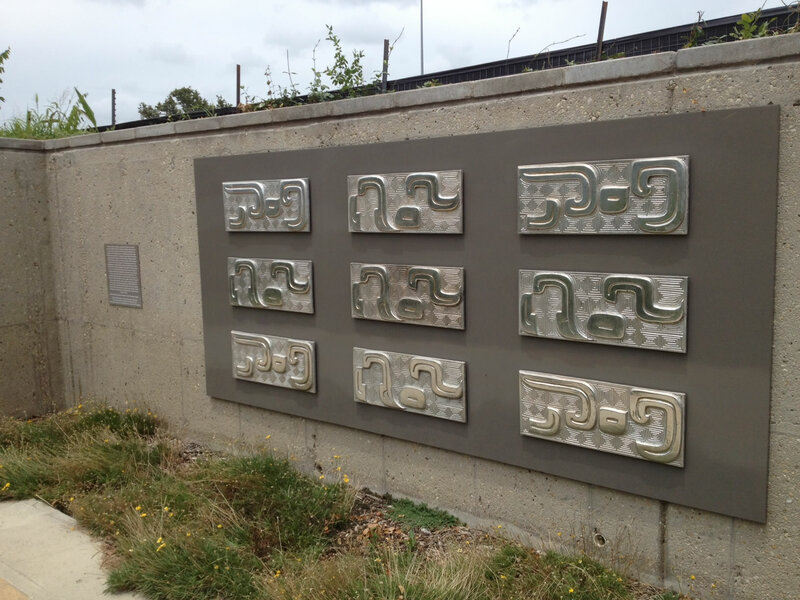 These decorative metal tiles originated in Taiwan and were a part of the 1968 HemisFair’s Taiwanese Pavilion. HemisFair ‘68 was a moment of rebirth for the Riverwalk. Without it, this section of the Riverwalk, known as the Museum Reach, might not have been possible. The display of these historic decorative panels along this section of the Riverwalk is a fitting reminder of the Riverwalk’s history and commemoration of the historical presence of the Chinese people in Texas dating back to their participation in railroad building in the late 19th century and the arrival of the “Pershing’s Chinese” during World War One. Directly across the river is the San Antonio Museum of Art, which houses and exceptionally important collection of Asian Art and continues to forge a vital cultural link to the world of Asia Pacific. The interlocking swirling patter on these metal tiles is known as leiwen, or the thunder pattern. Such a pattern was the dominant design motif on bronze vessels used in rituals by the ruling elite as early as the Shang Dynasty (circa 1800-1200 BCE) in ancient China. Over time the leiwen pattern became a popular visual element in the design of porcelain, jade carvings, textiles and lacquer. It has become emblematic of the ancient roots of Chinese Culture. Our special thanks to May Lam for donating this art installation.